Serendipity Creamery owner Jessica Weiss Levison is a visionary who dreams big. 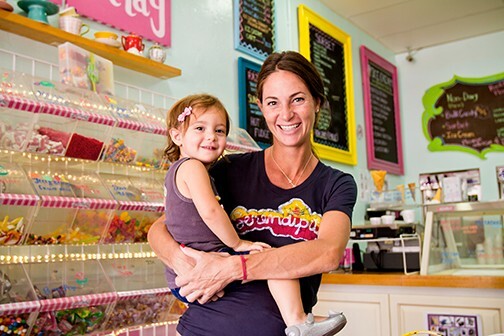 A former lawyer, Jessica’s path to ice cream started when she moved to the seaside town of Surfside and discovered that a local ice cream shop was missing from the neighborhood. A big fan of the sweet treat, she dreamed of opening a local scoop shop that kids in the neighborhood and the local community could enjoy. On a whim, she began experimenting with small-batch ice cream, using fresh ingredients and unique flavor combinations and with a few pop-ups quickly gained a following. After two years, she quit her job and opened Serendipity Creamery in 2008. The shop has since become a neighborhood favorite and well-known in the larger Miami area. Not only is all of the ice cream and sorbet made from scratch in small batches, Jessica also makes the marshmallows, the cookie dough, the peanut butter cups and everything else that gets folded into or put on top of the ice cream. She also uses organic ingredients whenever possible and regularly supports local farms and artisans, including Panther Coffee for the signature coffee flavored scoops. “We try to use local and organic ingredients as much as possible,” she says. As a nod to the neighborhood, Serendipity Creamery and Yogurt Café is certified kosher by Kosher Dairy Miami. The sorbet is vegan and the ice cream is “cholov yisroel,” which designates a higher standard of observance of kosher dietary laws with regard to dairy. ( A win-win for all). After some experimentation, lots of taste testing and some tinkering, Jessica created Peekaboo - it looks and tastes like ice cream with all the benefits of vegetables. “It took several years of tinkering - stealthily introducing hidden veggies into our classic flavors at Serendipity bit-by-bit, and then gradually increasing the number of veggies until customers noticed that their favorite vanilla was suddenly more complex. Then, scaling it back a touch.” Jessica says it didn’t take long for some customers to notice something was different. “With some flavors, customers were immediately on to me. Since we never use artificial colors for our ice cream, our classic mint chip is always the color of milk and cream. Suddenly, it was green [from the spinach]. It wasn't long before our usual customers were saying "Wait a minute!" The flavors range from chocolate with cauliflower to strawberry with carrot to mint chip with spinach. Without the label, there’s almost no way to tell that there are veggies hiding out in your dessert. “I chose mild-flavored and sweet veggies that also complemented the color of the flavors - beet for cotton candy, carrot for strawberry and spinach for mint chip for example,” she says of determining the right veggie flavor combinations. According to Jessica, the vegetable isn’t meant to be part of the flavor profile. She says, "It's supposed to be a traditional, indulgent ice cream. The idea is to get someone who won't go near a zucchini to try the vanilla flavor and realize they love it." It’s a bit of a switcheroo but for “mamas having veggie dramas” as Jessica likes to say, Peekaboo is just the answer. “I knew it belonged on shelves because I myself, as a mom, and separately as an adult with an insatiable sweet tooth, would have stockpiled it had someone else invented it,” she says. A first for the sweets industry, Peekaboo is making its mark. The ice cream is available by the pint at retailers across the country with more developments soon to come. “We will be launching new flavors, including a vegan flavor and many many more things you will never guess,” says Jessica. We can’t wait! Visit Serendipity Surfside Creamery and Yogurt Café in Surfside or try a pint of Peekaboo online or at local retailers.